I'm not a winter person, but I do like how clean the snow makes everything appear. A few months ago, I did a big clean out of my belongings as one of my seasonal cleaning projects. 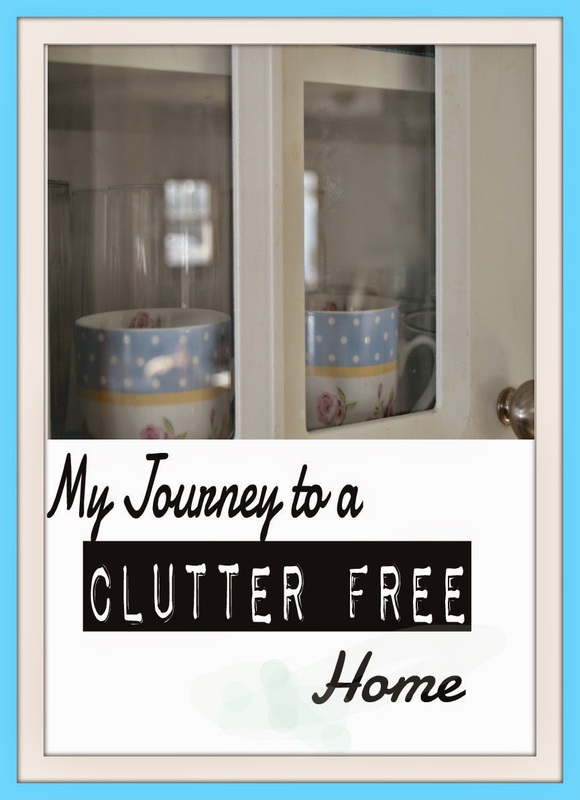 I've been living clutter free for three months now, and I love it. It is everything you think it is, and also some things you probably wouldn't imagine. While the mind references popular images of clean counter tops and sparse rooms with decorative baskets holding two books and an umbrella, it is not that. It is livable without being sparse. Here is what clutter free means at my house: Everything is in use, has a use, or is something we flat out love. If you love it, that alone makes it useful. Clutter free does not mean that I never have to take three things out of a cabinet before I find the bottle of vitamins that dropped down behind some dishes. It does not mean there is never anything that needs to be sold, donated, or reassigned. It does not mean that we do not have to store anything. Indeed, there will always be Christmas decorations in the attic, wrapping paper tucked away for the next gift, and swimsuits and towels that await warmer days. I maintain one small laundry basket in a corner for items on their way out, usually the final stop before they are donated. It took time. Three years worth of cooking magazines did not show up on my doorstep all at once. Also, persistence. Every time something was moved around I would analyze whether it was something we still needed or desperately wanted, especially with seasonal changes. A few posts back I mentioned our small house, and I think that is also a big help. If you don't get rid of the things that are no longer useful, you will have no room for new things to come into your home. Most of us have a finite amount of space to work with, and valuing the creation of empty space is as important as filling a space. I adopted a one-in, one-out philosophy. If I was bringing home something, what was it replacing? More often than not, something that was broken or worn out. It's a constant process. Although there is a time when you can savor and enjoy the things you own without the distraction of old stuff that has worn out its welcome, living without clutter require vigilance. After all, we're people who require tangible tools for living, and sometimes that is a family heirloom or less romantically, something made in China. There will be new stuff, old stuff, sentimental stuff, and stuff you can't stand. The biggest challenge? Getting everyone on board with it. The Mister is a man who likes his stuff, but even he realizes you can't fit a castle in a cottage. The mail delivery assaults us with new paper every day, and if Old MacDonald read just a fifth of the farm journals that arrive each month, there wouldn't be much time for pigs and cows. Be gentle, persuasive, and a good example. If all else fails, buy nice baskets and put stuff in them, and then remind the owner of the contents that the basket needs periodic attention. When clutter knocks on your door, it may wear a disguise. It could be a bag of hand-me-downs that are the wrong size and season, or something that seems like a bargain although you don't need it. Calmly explain that your treasures are being stored up in heaven. Ahh! I am breathing better already, just knowing how great it feels for you! As you know, I'm still working on my latest downsize/declutter/donate-fest (not to be confused with "donut-fest") as a result of having moved recently, but I can still empathize. I know how stressful it's been for you, in the years since I've known you, as you and your Mister work through all the construction and beautification projects on your home. It makes me so happy to know things are finally feeling more homey, as you guys accomplish so many of those goals. I had to laugh at your comment about the Mister being a man who likes his stuff. It takes no imagination on my part to understand exactly what that's like - the only differences are the different Misters, and the different stuff. My Mister, as you know, would never be found reading a farm journal, and somehow I don't see yours reading "Golf Digest." However, the rules HAVE been set down for my Mister, even though his training may never be fully realized. He's not allowed to make "stacks" anywhere; and he has already used up every bit of his own closet space. I have at least a third of my own closet space free and clear, but under no circumstances is he allowed to cross the line into my space. No new man-clothing items are allowed to come into the closet, without him removing a like item to the donate pile (not to be confused with the "donut pile" [can you see where my mind has been?]). In our downsizing project, our scanner has been our best friend, particularly for magazine articles, clipped magazine recipes, memorabilia or artwork that eats up too much space (think of framed "art" things like, say, a framed artist's rendering of the 18th golf hole at St. Andrew's - do you think that's going on my wall? No, no, Nanette! ), etc. So what do we do with that? We take a beautiful photo of it, then donate the actual item to someplace like the Salvation Army or Goodwill store. I also used to have years of magazines. Bit by bit, I removed the pages I wanted to keep, scanned them into my (yes, it's free!) Evernote program, organized it all in digital Evernote notebooks, and tagged it all for quick searching (the Evernote program even does OCR in photos, so you can search for an image of a recipe for "donuts," and the program will find it for you - mmm...donuts!). Then I trashed the magazines. As for incoming magazines and journals, nowadays, almost all magazines have the option to receive them digitally, rather than physically. That's what we have done, besides just canceling subscriptions to ones we don't have enough time to read. When you get the magazine digitally, you can also use that same free Evernote program to digitally "clip" the articles you want to save, tag them with keywords, and have them accessible in seconds when you want them. OR, you can just create your own regular kind of computer folder on your computer to save the digital copies. Anyhoo...congratulations on your accomplishments in this and in all departments!! And don't forget positive words of praise and thanks`giving for any steps of progress those misters of yours make along the rosy path to becoming clutter-free! What?! I got to publish that without proving I'm not a robot! Hallelujah! I know! It's new and it's wonderful! Oh, and I think you need to do a guest post for my blog on how to teach someone not to make piles. My BEST guess for dealing with a pile maker is to put the piles in attractive containers and remind the piler that the containers need sorting. We are putting in a new closet system soon, and I'm already explaining boundaries. Always working on keeping the clutter monster under control here too. As my children grow, change interests etc. there are always things to be donated or sold! Trying to keep up with 5 of them . . . oy! But it is so much better than the alternative--becoming a hoarder! Oh, I agree so much, and yes, children are an endless source of outgrown things. I'm always a little excited when I can re-home them in some way and hope the next child gets some enjoyment from the items!